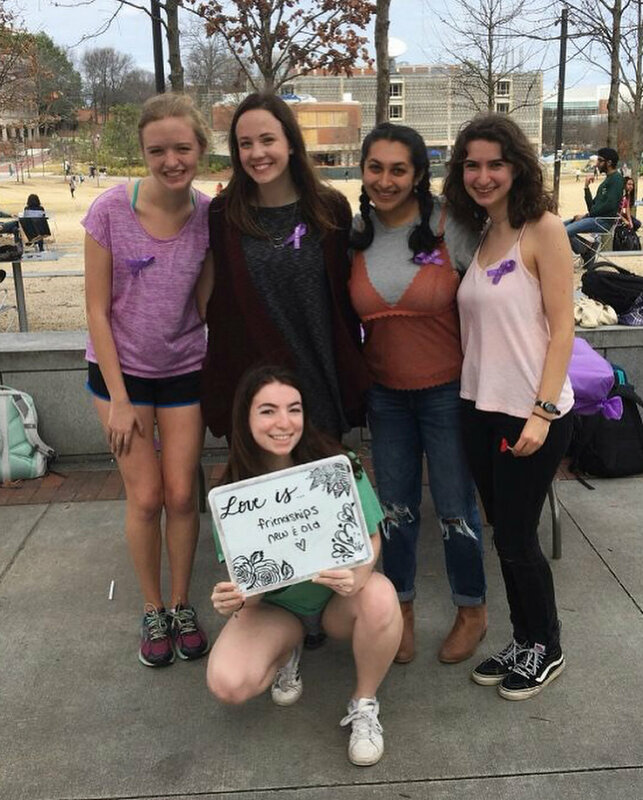 Alpha Chi Omega raises money for Domestic Violence Awareness and the Alpha Chi Omega Foundation, as well as our local shelther, Partners Against Domestic Violence. 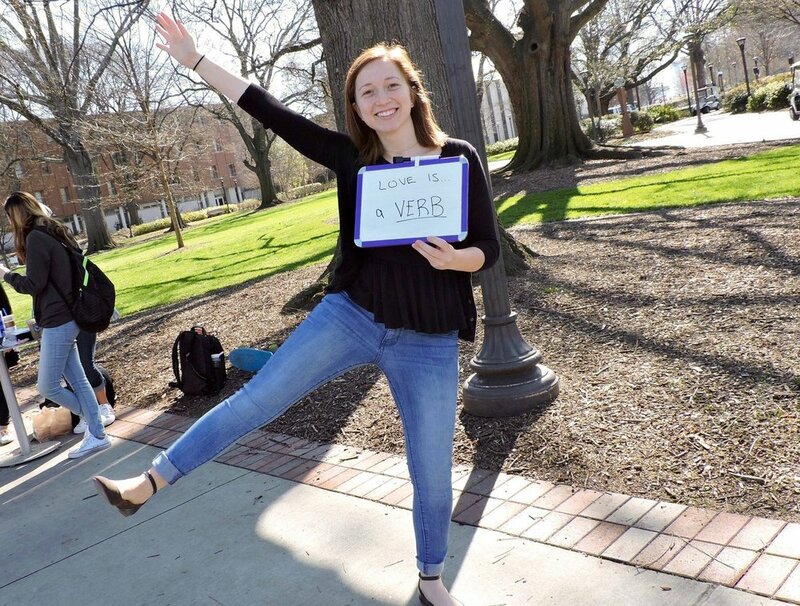 However, we also dedicate our efforts to simply raising awareness of the sexual assault, harassment, and abuse that happens around us every day, and doing all that we can to prevent it here and now. We do so throughout our campus and community in the following ways. 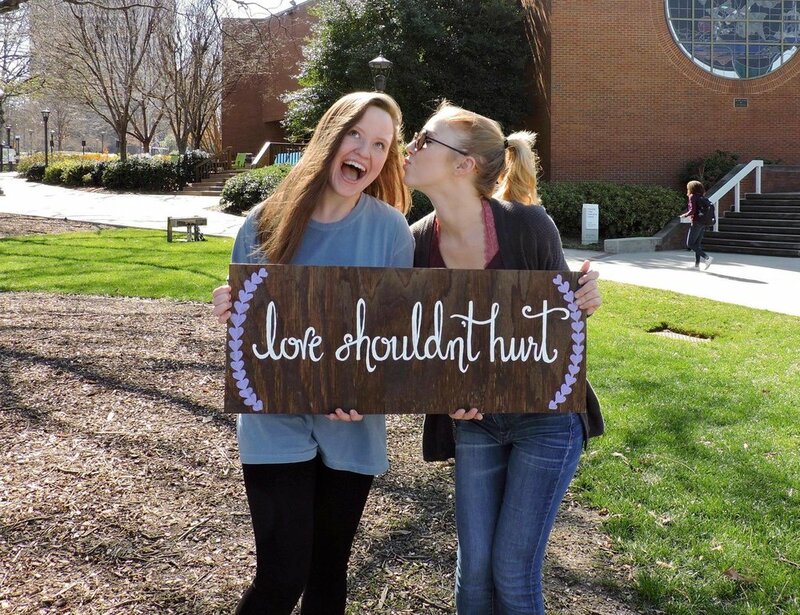 Nationally, Alpha Chi Omega holds Domestic Violence Awareness Week. This week takes place every October and is dedicated to raising awareness of domestic violence, especially across college campuses. By discussing this issue in a variety of light-hearted ways, such as donut talk, we remove the fear and discomfort that is so often associated with this frequently uncomfortable topic. In addition to tabling and a variety of events to this effect, we also raise money for DVA, the Alpha Chi Omega Foundation, and our own local Atlanta shelter, Partners Against Domestic Violence (PADV) through a benefit concert and bake sale. To celebrate Domestic Violence Awareness Month, our chapter hosts a healthy relationships talk at our house. We open it up to everyone on campus and invite a speaker from the women's resource center to come and present on what a healthy relationship is and how to create one in our own lives. We also have free Krispy Kreme Donuts for those in attendance. During DVA Week each year, we hold a Benefit Concert in order to continue the conversation about the dangers and reality of domestic violence, as well as to raise money for those who experience it. This year we held the concert in our backyard, along with a fundraiser dinner inside. There was live music, dancing, and lots of love and support for our cause! 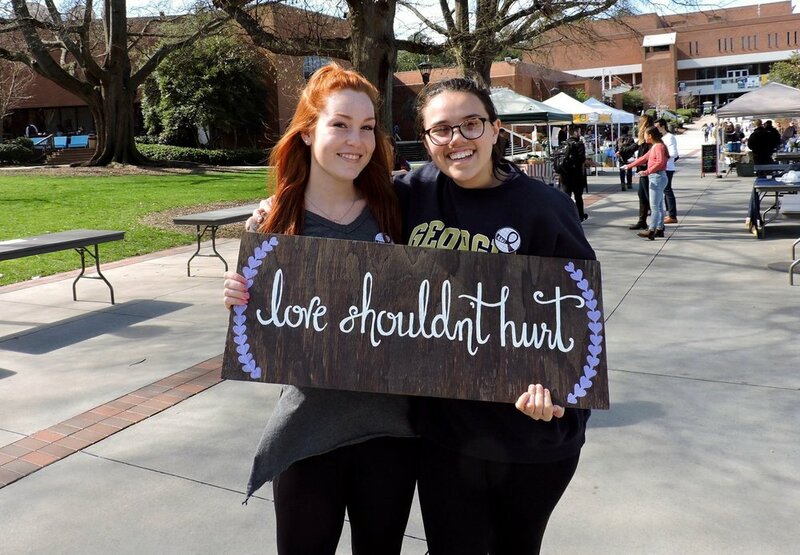 While Domestic Violence Awareness Week is our primary philanthropic focus during the fall semester, each spring Alpha Chi Omega participates in Healthy Relationships Week. 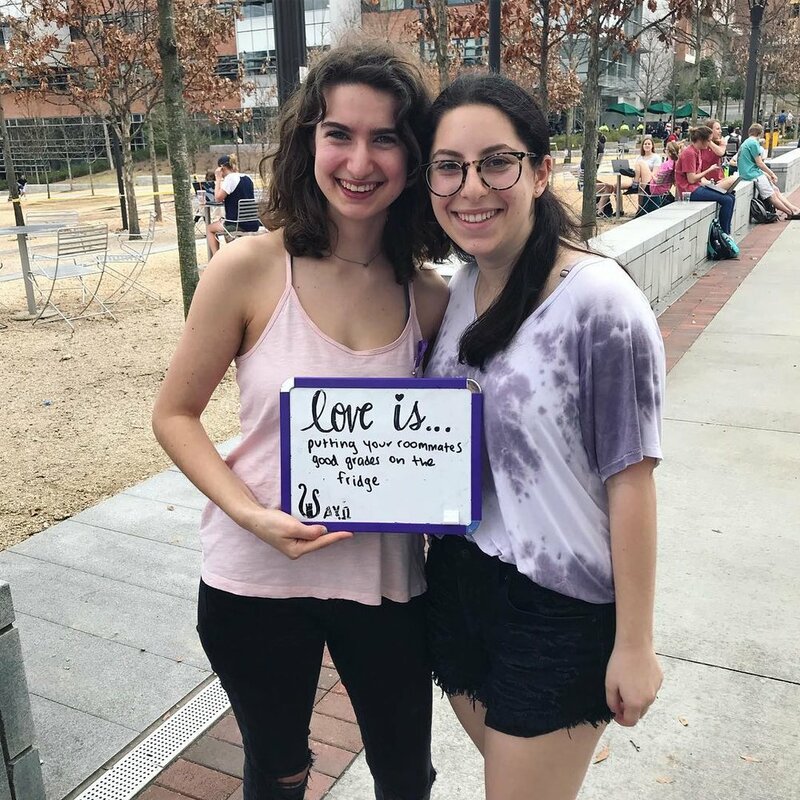 Throughout the week of Valentine's Day, our sisters spread the message that relationships should be healthy, loving, caring, and kind, whether they are romantic or not. Even our friendships should uplift us at all times, so what better way to once again raise money and awareness for DVA than together? Around Spring Break each spring semester, we hold a Taco Dinner Fundraiser in our chapter room. Members are encouraged to bring their friends, peers, strangers, everyone, so that we can best open up the floor about DVA and its impact to as many people as possible in yet another light-hearted, yet no less impactful, way. Students from all over campus enjoy visiting our house to socialize, raise money for our cause, hear stories from survivors, watch performances by our sisters, and eat yummy tacos! 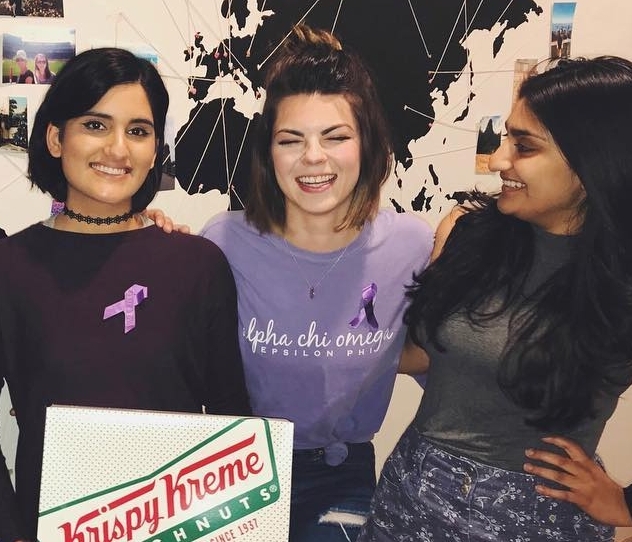 Our chapter recognizes the value of not only donating to causes, but actually and actively participating and developing relationships with people in order to make a difference. This is the idea behind our increased involvement at our local Atlanta shelter, PADV. We know that oftentimes it is more meaningful and impactful to contribute the skills we have where we are needed than it is to blindly sign a check. That is why this year alone, we have volunteered each semester at the PADV daycare, organized the clothing boutique, and even written Valentine's Day cards for survivors and their children. We look forward to continuing and fostering these interactions in the future.